To see how IITA is assisting the Nigerian youth engaged in the IITA Youth Agripreneurs (IYA) scheme to generate novel businesses from agriculture, the President of the African Development Bank (AfDB) and former Principal Economist at IITA, Akinwumi Adesina, paid his first official visit as President of the Bank to IITA’s Station in Abuja on 27 September. 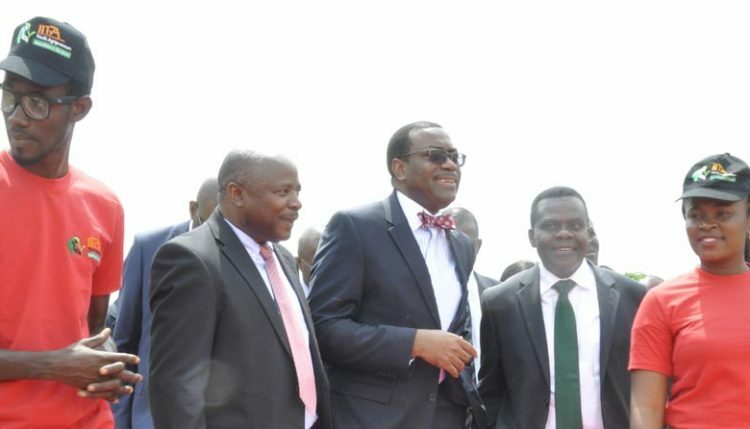 DG Nteranya Sanginga and the Agripreneurs welcome AfDB President Akinwumi Adesina to IITA’s Abuja Station. 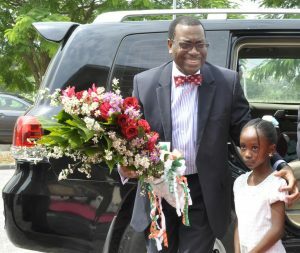 Adesina also came for discussions on the implementation of the Empowering Noble Agri-Business Led Employment (ENABLE Youth) project of the AfDB in the country. IITA, together with the Federal Ministry of Agriculture, will implement the ENABLE project with a US$300 million grant from the Bank and will see the creation of 1000 youth entrepreneurs in agribusiness in each of the 36 states, with an expected additional 185,000 jobs created. A smiling AfDB President being welcomed with flowers by Glory Paul, the daughter of an IITA staff member. Ag Director Sunita Pitember – Director, Social Development; Ismaila Dieng – Director of Communication; Lamin Barrow – Manager, Office of the President; Ag VP Janvier Litse – VP Regional Operations; Ousmane Dore – Country Director, Nigeria; Jacob Mukete – Former Director, Governance; VP and Chief Economist Celestine Monga; VP Human Resources Alberic Kacou; Director of Agriculture Department Chiji Ojukwu; Executive Director AfDB Nigeria Bright Okogu, and Country Director Nigeria, Chief of Staff Sipho Moyo, among others. A former ambassador to The Netherlands also represented Nigeria’s President Muhammed Buhari. A group photo in front of the new Agripreneur building in IITA’s Abuja Station.